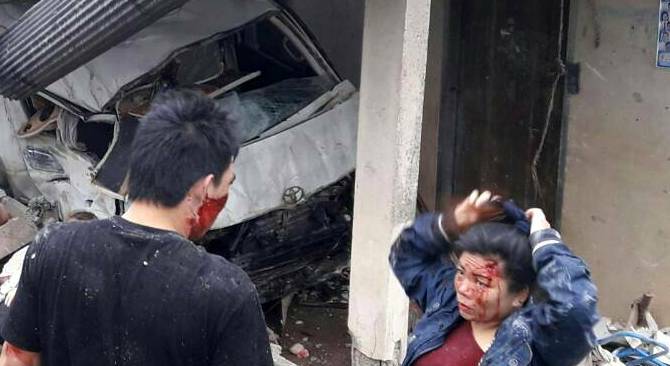 PHUKET: The fatal accident involving a mini-van from KBV Phuket Visa Run, which resulted in the death of three of its passengers on December 21, came as little surprise to those that have lived on the island for some period of time. Those who have lived here long enough are fully aware of the reputation of KBV’s drivers, and comments made on both The Phuket News website and Facebook page in relation to this news story should make the owner of KBV Visa Run and government officials fully aware of the reputation they do have, which, being frank, is diabolical. But what did come as a surprise was that following the accident the driver of the van was charged with reckless driving causing death and injury and fined a measly sum of B150,000 for causing the death of those three passengers – or perhaps we should say “manslaughter” of those three passengers. That same driver may well have been behind the wheel of another KBV Visa Run vehicle the very next day after he, or someone on his behalf, paid the fine. Who knows? That penalty, if you can really call it that, makes it clear that any road accident that results in the death of a passenger, be they foreign or Thai, means very little according to Thai law. In this case each death was worth just B50,000. Now let’s step over to the UK and look at a road accident that happened there in May 2014. The driver of a bus was taking a group of 50 pensioner day trippers on a day out when he lost control on the bend of a steep hill. That accident resulted in the deaths, or should we say the manslaughter, of two of his passengers. This driver was also charged and found guilty of causing death by dangerous driving. But the big difference here is that on August 22 this year the driver was sentenced to five years in prison. It may have taken some 27 months for this case to be settled in court, but at least, according to one of the deceased person’s relatives, justice was served. So a jail term of five years for causing two deaths by reckless driving compared to B150,000 for causing three deaths by reckless driving, is there really any justice in that? CaptainJack69: Very well written! Very clear. Now it would be nice if Thai Immigration offices do a bit more public relations regarding this matter. Also Thai Embassies can do a good job to inform travelers on forehand. No more dangerous and unneeded visa runs! Great! The only kind of 'justice' that can really come of this tragedy would be for everyone to stop using the 'visa run' service. But bearing in mind that most people getting on them are already well aware of their dreadful reputation and still choose to use them regardless, that doesn't seem likely. Christy Sweet: I understand what you mean. However, visa runs are done by foreigners. That was the subject. But you are right, I should have separated that part of my writing ( foreign life value is just 50,000 thb = 1315 Euro's only) in a different alinea. Kurt,  I did not specify " foreign life.." IMO, it's pretty much all life and sprouting from a cultural motif of "you deserved to die," and "you'll come back." The local expat who use the visa run must surely realize these mini buses are death traps, just watch as they race one another back and to from the airport for example. Van drivers are like taxi and tuk tuk mafia so some money may have been paid under the table to the authorities to avoid jail. Indeed, we live long enough on Phuket to know anything , in a negative way, about KBV visa run company. And as we know, so of course thai authorities do, not at last the Immigration departments, know about this life threatening visa run happening very well. It is simple, no thai authority cares about it. Much proof is there. Right? Thais simply have a completely different mindset when it comes to life and responsibility, but tourism officials like to pretend otherwise. Travelers need to be aware of this when deciding where to vacation. Thanks PN for keeping it a public issue.